two sizes: 7-9in and 8-10 ins round lower leg. Requires 100g/ 400 yds of sock yarn and 2.25mm double pointed needles. 34sts=4ins (10cm). 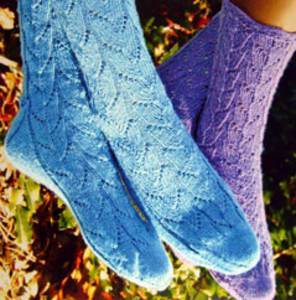 Suggested yarns Lorna's Laces Shepherd Sock, Regia Silk, Cygnet wool rich 4 ply.